This is Eliza Perry’s final blog post as a Hubbard Fellow. However, as you’ll see below, it is not the end of her employment with The Nature Conservancy. Meanwhile, two new Fellows have moved in to fill the void left by Eliza and her fellow Fellow, Anne Stine. Dillon and Jasmine will be introducing themselves to you shortly. For me, Friday June 6th marked the last day of a wild ride—a totally unforeseen, extraordinary, defining year of my life. I had been stalking The Nature Conservancy’s employment website for weeks before this incredible opportunity popped up and I went for it with all I had. This has easily been the most fulfilling year of my life and I know I have learned a great deal more than I could have ever anticipated. Eliza gave a presentation on her Fellowship year and accomplishments at the May Board Meeting of The Nature Conservancy’s Nebraska Chapter. Under normal circumstances, I would have documented every day of my last few weeks, taking upwards of a thousand photos in fourteen days. Tragically, I dropped my camera while filming our wetland restoration at night so words will have to suffice. Growing season is such a busy time for us, but I had to leave just as it was getting underway. Invasives like musk thistles and poison hemlock were becoming very apparent features in certain areas of our properties, and we use this early window to beat them back before they outrun us. 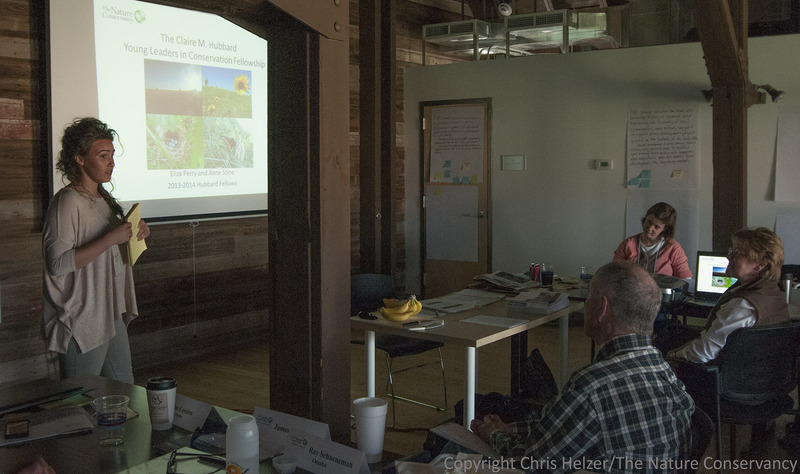 I also got to hang out with and train the next class of Hubbard Fellows, which was an incredible privilege because maybe the best part of all this is knowing others will be able to experience something like my year at the Platte River Prairies. I’m writing this with my feet dangling off a pier in my hometown, looking out on a view that I took for granted my whole life. But the blue ocean doesn’t feel like home right now because I’m missing the golden green oceans in Nebraska. I could not be more excited about the fact that I will be back to the Good Life in a few weeks to start in my new position with The Nature Conservancy in Nebraska as our Major Gifts Manager in Omaha! I am thrilled (and nervous) and convinced that there could not a better continuation of my journey in conservation. I’ll be entering the whole new world of fundraising alongside my favorite TNC chapter. While I might have worded that a little differently these days, it still perfectly describes why I am working in the field of conservation. I want Nebraska’s beauty to continue to exist and thrive because it must and because it ought to. Everyone in conservation has their own reasons for fighting the good (often steeply uphill) fight, but this past year has made it only more of a compulsion for me. 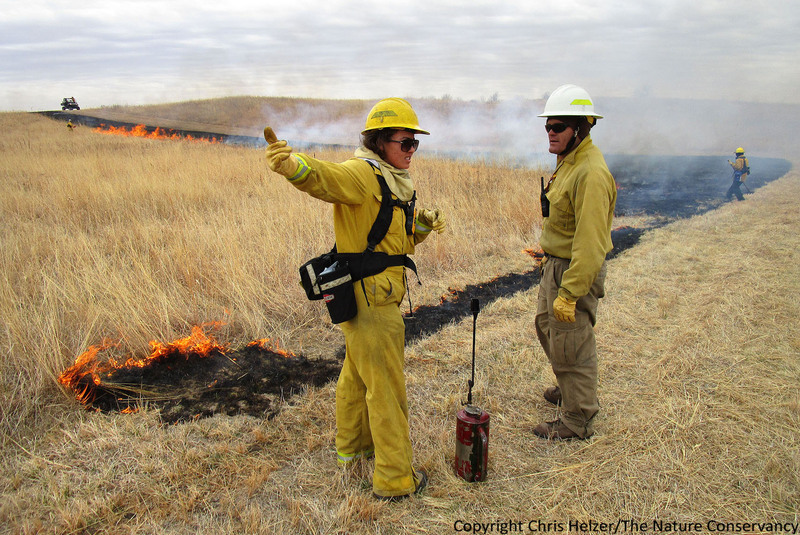 Prescribed fire was just one of the activities Eliza (left) gained experience with during her Fellowship year. And boy was I in good company. As all of the visitors to this blog know, Chris Helzer is a marvel and an inspiration. His passion can sway some of the most staunchly opposing forces. I am still amazed I got to work with him and try to absorb some of his wisdom. The same goes for Nelson Winkel, land manager at the Platte River Prairies, who is truly my hero. The amount of work that each of them and all the other staff members at our chapter accomplish every day is astonishing. The fellowship is only one of innumerable things vying for their attention, but we were always given the support and guidance we needed to get ourselves working independently and well. This chapter, especially trustee Anne Hubbard whose generosity is the reason I just spent the year with TNC, recognizes the important voice that inexperienced aspiring conservationists can contribute to the cause of protecting and enhancing natural resources. Together we have pioneered a growing movement within the organization to provide professional development opportunities to young people so they can propel conservation forward. Ending one chapter and beginning another always feels surreal and I tend to get extra sentimental. I am so proud to be a Hubbard Fellow. I feel fortunate beyond words to have spent the last twelve months with my mentors on the Platte River working for an organization that does so much good for the world and for Nebraska. This entry was posted in General, Hubbard Fellowship and tagged eliza perry, hubbard fellowship, nebraska, the nature conservancy by Chris Helzer. Bookmark the permalink. What an inspiring read to start my morning! Congrats on the next chapter of your life, Eliza! Glad to have you on board in the Good Life! As one who was born and grew up in Richardson County, that Eliza is glad to resume working among the “golden green oceans” delights me. Best wishes! I am absolutely delighted you will be returning to the prairies. Me too, Ann – see you soon! Congratulations, Eliza! I hope that you’ll continue to post your writing from time to time – you have a gift for expression as well. How great it has been to follow your internship, and how wonderful that you are staying with the chapter! Great start to your career, Eliza! Chris: please send congratulations to Eliza on her new position w/ TNC in Omaha. Based on what she has written she will be a tremendous advocate toward enhanced protection of our endangered native diversity. You really are a sweet heart. I wish you luck. You should really enjoy hosting some of the people who make things happen in Nebraska. Much continued success as you follow your dreams Eliza!! Chris, great stuff and thanks as always for your posts on this blog!!! I love this – ‘resume working among the “golden green oceans” ‘. I always feel this way when I return from a place with big water, including the Great Lakes. Welcome aboard to the great American grassland! Reading last night the essays in the recently published “Tallgrass Prairie Reader”, one of the authors referred to the prairie as “the chrysophase sea”, a similar way of thinking about it.